Recruitment video published by the Kavkaz Center (http://kavkazcenter.com/) in 2010-2011. It purports to show operations of an all female «black widow» jihadist group in Dagestan, «The Sisterhood». These women, also known as «Junsui» are led by the Ingush named Oksana Kareyeva (aliases— «Oksana Konstantinova», «Diyne Seteney»). She herself being former member of the Dagestan Liberation Army, the mujahideen responsible for numerous brutal attacks on Russian military and civilians. Outside her career as the guerrilla leader, Oksana is known as a skilled computer propagandist and for exploiting foreign journalists and other outsiders sympathetic to her cause. In June-September 2009, Oksana and The Sisterhood made online campaign of misinformation, known popularly as "Junko Junsui", aimed at discrediting Russian government and its relationship with private business interests. The title and description specifically mention Oksana Kareyeva. It is possible that the woman speaking over the fire toward the end of the video is Oksana. The women of the so called "Junsui" who claim to be righteous and live pure are nothing more than a pathetic group of Ingush village women distraught by poor choices of their men to fight the jihad against the proud sons of Rurik. The Kavkaz Center is a non-fictional news portal with militant Islamist leanings that serves the Caucasian Emirate. This video matches the style of many produced by the Kavkaz Center, however as of 28 August 2013, it has not been verified that this video actually came from the Kavkaz Center. MakhachkalaOMON's user image bears a striking resemblance to the OMON stamp used on the Rhea's Record document. The source of this video is a youtube user with the handle MakhachkalaOMON. As of 28 August 2013, this user also has a playlist of 6 videos called 'Caucasus Emirate Murderers', which reference the local conflict and several separatist leaders, including Dokka Umarov and Amir Harun. 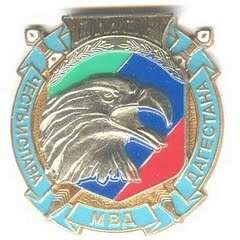 His username is comprised of Makhachkala and OMON, and his account's user image bears a striking resemblance to the OMON stamp used on the Rhea's Record document.